I recently did a write up of three of the best climbing destinations in Northern Ecuador (ie: close to Quito). I have received a surprising amount of interest in terms to Ecuadorian climbing. I think that a lot of this comes from the general lack of information available online, combined with the overall air of ambiguity which surrounds the country. So because of this, I have started to fill in a bit more of the missing information about this country’s climbing. This article is going to focus on one of Ecuador’s top destinations: La Chorrera de San Juan, or just “San Juan”. Located only about 40 minutes from the city of Riobamba, San Juan provides a good assortment of about 100 routes at various grades from V+ all the way up to 8c+, with everything in between. One of the more unique aspects of climbing here is the location. The altitude is around 3550m (11,650ft), and offers incredible views of nearby Chimborazo, Ecuador’s tallest mountain (6268m), and the the highest point on earth (yes, I’m serious). As you might imagine, the weather here is intense. Storms are commonplace year-round, and it gets very cold at night. All this makes for a nice adventure if you ask me! San Juan is located high in the Andes Mountains, in Ecuador’s Chimborazo Province. As I mentioned before, the closest major city is Riobamba, so you’ll want to head there first. The city doesn’t have much of an airport, so you’ll most likely have to arrive by bus. Luckily, most major bus terminals in Ecuador will be able to take you there. You should be able to arrive in Riobamba from Quito in 5-6hrs. From Riobamba terminal, you can take a local bus towards the Volcano Chimborazo. 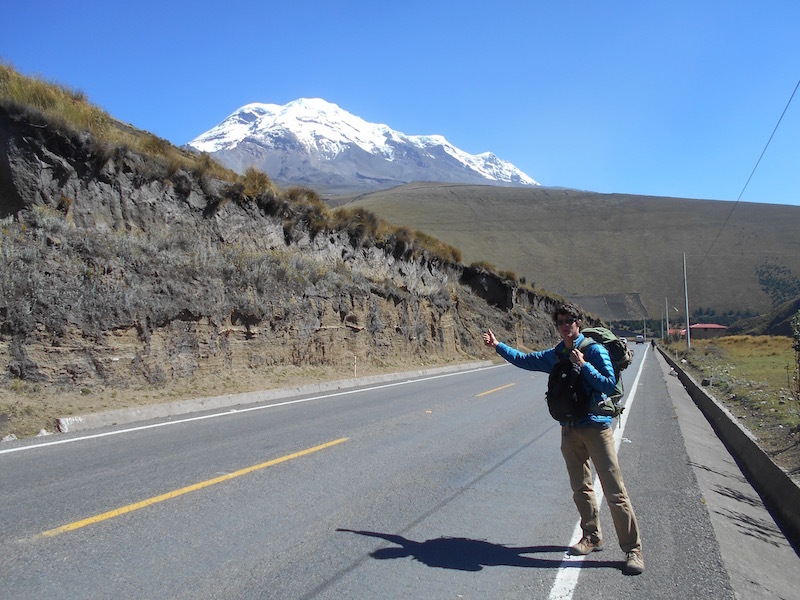 There are two options here: either take the bus directly from the Riobamba terminal to Chimborazo, or take a bus towards Guaranda and get off in the small town of San Juan (different than the climbing area), then flag down a bus north towards Chimborazo. The climbing itself is located about 13kL after the town of San Juan. You will first see a sign which reads: “La Chorrera” on the left hand side. About 500m after this, you’ll see a parking lot where you can park or get off the bus. The exact location can be seen here. From the parking lot, there is one main trail which will lead you down the valley towards the cliffs. So there isn’t what I would call a huge amount of options of places to stay available right next to the rocks. 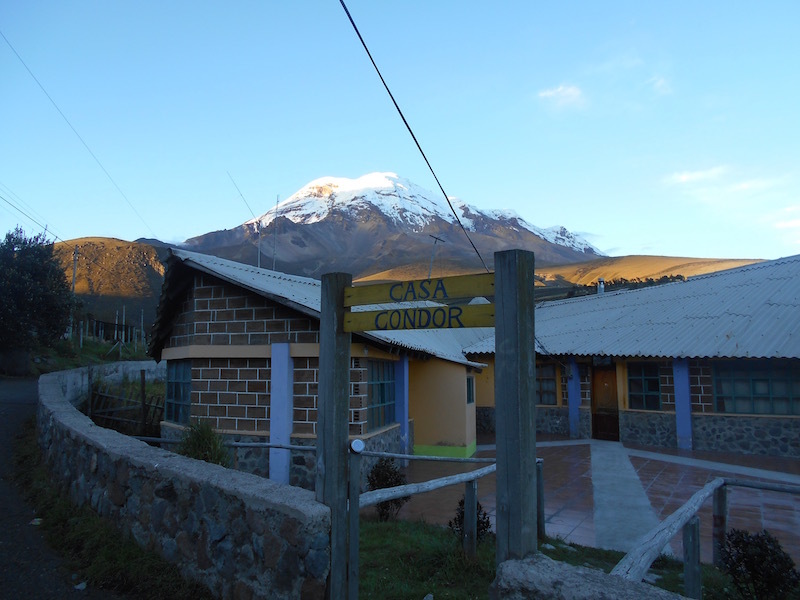 However, due to the close proximity to Chimborazo, there are a few options which cater more towards the mountain trekking crowds. Keep in mind that these are all rural, and can therefore be quite pricey ($15-30 USD or more a night). The closest town of San Juan is going to have a few options, as will the much larger town of Riobamba. You could, of course, always camp in the valley, but keep in mind the elevation and make sure you have a very warm sleeping bag. 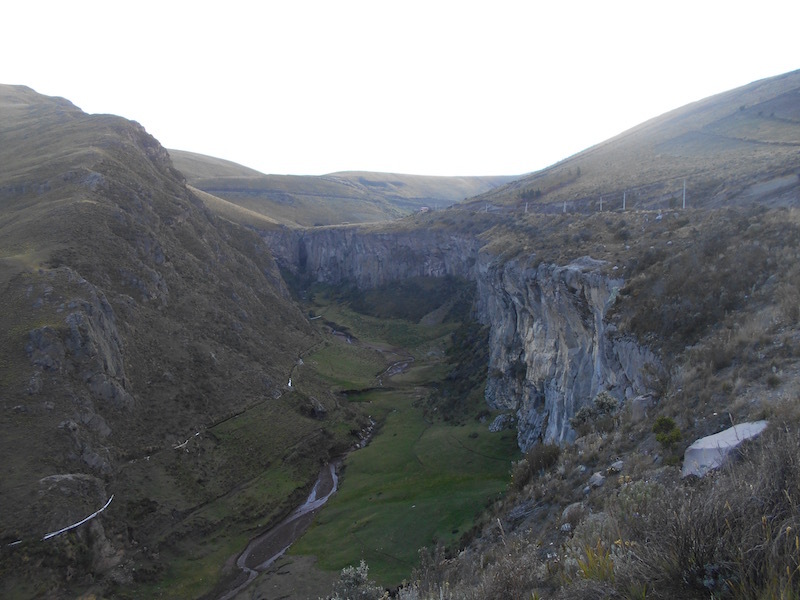 The climbing is located in this large valley formed from glacial runoff. The rocks are volcanic, of good quality, and the style of climbing is varied. There is something here for everyone, from super hard roofs, to slabby beginner routes. Only about 20% of the 1kL long valley has been developed, which means it has the potential to become one of the largest areas in Ecuador. It is highly unlikely that you will see another climber, so make sure to come with a partner. A well put together topo can be found here. Like with any country located on the equator, there isn’t a summer or winter, but wet and dry seasons. The dry season here is June to September, and the wet season is October to May. Keep in mind that due to the alpine conditions, you can be struck with poor weather any time around, and the weather changes rapidly. For this reason, packing can be slightly difficult. You’re going to have to make sure to bring lots of layers suitable for cold and wet conditions. If you are lucky enough to be there when the sun comes out, you will experience incredible views of nearby Chimborazo and the power of some of the most intense sun on earth. Sunscreen is essential here. Climbing equipment wise, a 60m rope with a set of 15 quickdraws will get you up almost everything. There are a few trad climbs and a lot of loose rock, so bring a helmet. Make sure to stock up on food in the nearby towns, as there is almost no civilization where the climbing is located. I would suggest bringing food from Riobamba. Though there are supplies in San Juan, the options are limited. This includes water, as the stream which runs down the valley is contaminated with animal waste. At the very least, make sure you have some sort of filtration device. Ecuador isn’t the home to an astonishing amount of rock climbing, but in terms of what the country has to offer, San Juan is without a doubt one of the best. Climbing aside, the setting here is utterly unique and it is worth making the trip out just to see. The entrance to the Chimborazo national park is nearby, which is a world-class destination in its own right. 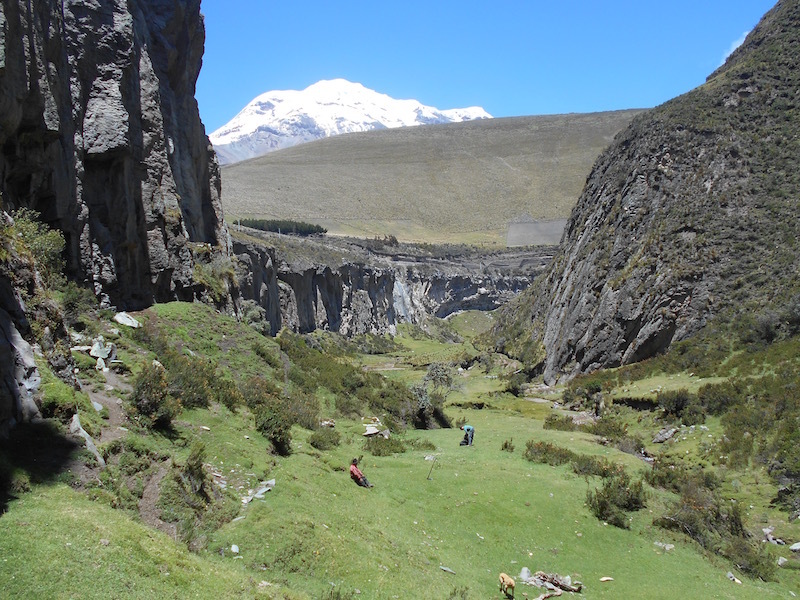 If you go, you’ll be in pure Andean wilderness, complete with packs of roaming vicuñas, stunning mountain views, and good quality rock. Don’t fly across the world to visit this one, but if you’re nearby, I’d say it’s worth checking out. For further reading see: “Northern Ecuador’s Best Rock Climbing” and “The 3 Best Places to Climb in Colombia“. Thanks for writing these up, Jacob! I’m really enjoying your mix of story, fun facts, and need-to-know details. This is super helpful given the dearth of info online. The pics look great too! Hey Aaron. Glad you found it useful. This is exactly why I decided to put it online… there just isn’t much out there for South America. Comments like these keep me going. Thanks!